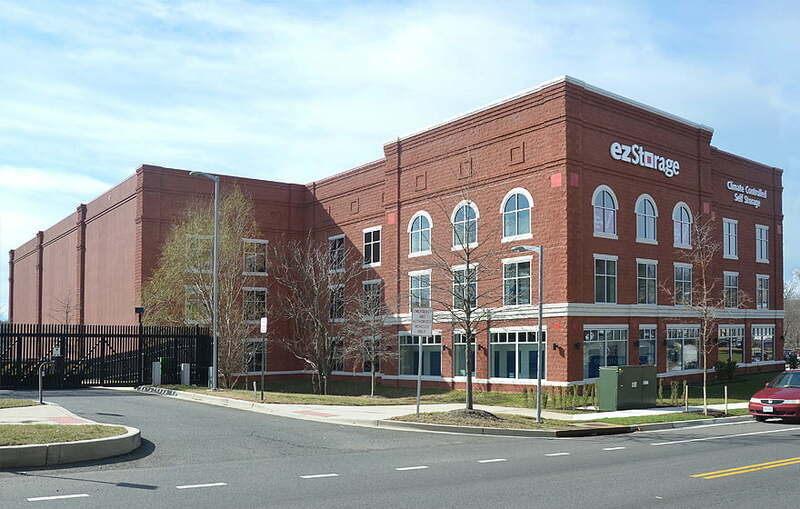 The Siena Corporation found the location for one of their most recently completed ezStorage facilities in the City of Alexandria, on Wheeler Avenue. An interesting part about this particular site was the existing historic building on site- a four story brick mill that was constructed around 1812 and functioned as a mill into the 20th century. It had served as an office building with a recent addition being used as auto repair shop. As part of the project scope, the addition was removed, brick repointed, and deteriorated siding replaced in order to restore the building’s historic nature. Since the new storage building was to be placed on the same site as the historic mill building, it required the approval from the Alexandria Board of Architectural Review. with the historic architectural language of the city of Alexandria. Studio 343 helped the client navigate through the historic approval process. The new five-story, 129,000 SF storage facility achieved LEED Silver certification and was completed in 2018.